MIAMI, Florida - A late-season tropical depression will likely form over the Caribbean by the weekend, according to NOAA's National Hurricane Center in Miami, Florida. The Atlantic Hurricane Season begins on June 1 and ends on November 30. 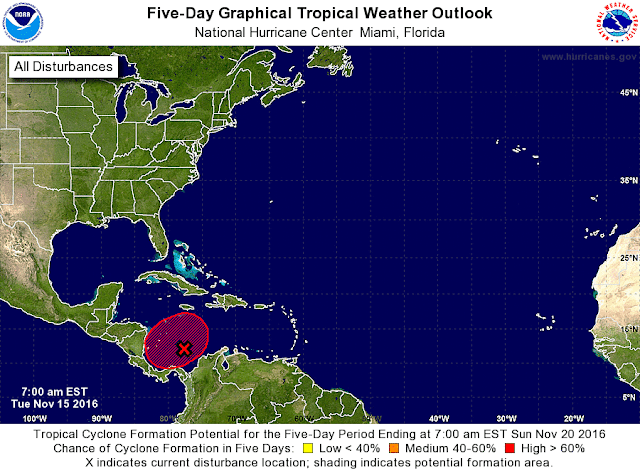 A Tropical Weather Outlook issued at 7 a.m. EST on Tuesday, November 15, 2016, by the NHC forecasts that a large area cloudiness and thunderstorms associated with a broad low pressure system located over the southwestern Caribbean Sea has an 80% chance of becoming a tropical cyclone during the next five days. If this system, dubbed Invest 90L, becomes a tropical storm, the next name on the 2016 Atlantic Hurricane name list is Tropical Storm Otto. Spaghetti models for Invest 90L are not in agreement of a projected path. However, NHC forecasters believe that this low will drift northward or northeastward through the week. Historically, the prevailing path of Atlantic tropical cyclones that form in November originate in the Caribbean and then move to the northeast over Cuba before entering the open western Atlantic Ocean.